My experimentation and experience with the Krups blade coffee grinder machine model# 203-425 turns up the following analysis. The grinder has a nice sleek design and it grinds fast. It is both affordable at below the $20 mark (currently, at the time of this writing, online as well as various retail stores), and also high capacity grinding up to 3 ounces of coffee beans in one batch. This capacity allows grinding enough coffee for more than one full 12 cup pot, perhaps two. 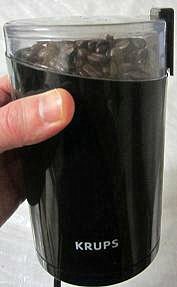 The 200-watt motor coffee grinder works fast and crushes the beans to "dust" in just seconds. It is also easy to press down the power button on top of the lid to grind. The Krups grinder is among the best low-end home coffee blade grinders out there, definitely worth its price. Generally, the Krups coffee grinder machine is superior to the Proctor Silex E160B (or 45802BY) in both its design and functionality. The former has a more contemporary design and outperforms the latter notably. However, there are also some positive points for the Proctor Silex over the Krups grinder. Both lack grind level settings or any programmable features. The Krups is a higher capacity machine, grinds fast and fine. Both are manually operated in that one has to press the grind-button 'till the completion of the grind as opposed to automatic coffee grinders. As said, the Krups coffeegrinder has a higher capacity and grinds more beans in one batch. However, despite its limited capacity, the Proctor Silex takes enough beans to grind for 7-8 cups worth of coffee, so if you only brew half a pot or so, the capacity factor wouldn't be of much significance. while the Proctor Silex has its button on the side of the cover, making it hard to press with the thumb (or other finger) against the machine, the Krups's button is on top of the lid, allowing for conveniently keeping the button down with the finger or palm. There's no question regarding the differences in effect between coarsely ground and fine ground coffee. Here's another difference: the Prcotor Silex produces a coarse ground, and the Krups grinds much finer. Still, if you ain't very particular, and price matters much to you, the Proctor Silex may satisfy your needs and produce a grind for good enough coffee. NOTE: with the Krups you'll need to measure LESS than with the Proctor Silex due to the finer grind resulting in a stronger cup (perhaps because there's simply more coffee concentrated in less space). On the other hand, if you're on a tight budget and looking for the more affordable solution, the Proctor Silex would fit the bill being a cheaper coffee grinder priced at below $15 at some sites and stores. Nonetheless, the Krups is not expensive either, and the difference in price between the two amounts to just a few dollars. An advantage of the Proctor Silex vs the Krups coffee grinder machine is that the former has a retractable cord winding in and out by turning the machine; it is a cool feature and space-saver lacking in the Krups. It is also more compact and has a smaller footprint than the Krups. Another notable advantage of the Proctor Silex is that when the grind is done, you can simply turn it upside down, tap it 2-3 times and the whole content empties into the lid, whereas with the Krups the grinds remain clung in the machine and it's quite a pain to scratch it all out. This, in my view, is a real shortcoming of the Krups coffee grinder machine. Bottom line: the Krups is a better coffee grinder machine, in design, capacity and performance. There are some advantages of the Proctor Silex over it. If you're on a budget and looking for a very cheap coffee grinder, the Proctor Silex may suit your needs. Do You Have a Comment on the Krups Coffee Grinder Machine?